While I was in northern New Mexico my meditation teacher gave me a bag of blue cornmeal from the local farmers’ market and the suggestion that I teach you to chew slowly. Two days into the retreat she recommended that we chew the first three bites of each meal thirty times. Meditation retreats are full of odd suggestions to the uninitiated. The first time I went to one the teachers told us as we took each bite of food to think about all the things that produced the food: air, sun, rain, soil, bacteria, seeds, farmers, labor, plants, wind, bees, etc., etc. We were eating vegetarian food so we did not have to think about the animals who died, although they did mention bugs and mice killed in the fields during harvest. They instructed us to note while we ate biting, chewing and swallowing, if not the arising of the urge to bite, chew and swallow. After three meals of thirty-chew first, second and third bites, we compared notes. One woman said she noticed that each kind of lettuce tasted different. A couple of women said they forgot about slow chewing until partway through each meal. One said she normally ate her meals in five minutes and that the slow chewing allowed her to look around and notice where she was. Some people said they ate less food. Others said they digested their food better. Two of us said that once we started counting chews we found it hard to stop. Lisa provided statistics: 43 chews per piece of bread, 32 per bite of salad, 51 per leaf of kale. When I thought I would bring you something back from New Mexico I thought perhaps I would bring the recipe for butternut squash lasagna with bechamel or the potato and artichoke soup with chicken, or the intriguing brown soup of roasted parsnips and turnips. I did not imagine I would tell you to chew three bites of food thirty times during your next three meals. Try it if you want. You might notice the licorice taste of tarragon in the soup, the bite of the basil salad dressing, see the way a raw onion sends its sulfurous chemicals to the roof of your hard palate soon after you taste first the sweetness, then the sharpness. Meanwhile spring has hit California with rain, blooming rhododendrons, pale daffodils, camellia buds, flowering fruit trees. The cold mornings and nights call for wintry soups. Here’s an easy one, a gluten-free, vegan corn soup, made from the kind of things that can get you through the winter and the bright flavors of lime and cilantro, which grows here long after the basil is gone. I copied this from a bowl of soup I once had at Radio Valencia in San Francisco, taught myself to notice the flavors and construct a similar soup. You can make it in the summer, too, when sweet corn comes in, but frozen corn is adequate for these frigid days and it’s a nice change from winter roots and greens. Mise in place: you will need just four ingredients: a bag of frozen corn, a jar of red salsa, two limes, one bunch of washed cilantro (fresh coriander), including the roots. You may reserve a few cilantro sprigs for a garnish. Equipment: one stock pot, one chopping knife, one blender and two hands. Get out your stockpot and put it on your largest burner. Plunk your frozen corn into the stock pot and open your jar of salsa. Pour the salsa over the corn and turn on your burner to low heat. Cut your limes in half and squeeze their juice into the pot (I just use my hands for this). If the limes are hard, roll them around on your cutting board before cutting and squeezing them. Now chop your cilantro, roots, stems and all, and throw it into the pot. Rinse your salsa jar with plain water and add the water to the soup. Cook until the corn is soft and puree the soup in the blender. I do this in several batches, sometimes leaving some whole kernels of corn for texture and appearance. Food notes: I have made this with one pound of corn and fourteen ounces of salsa and with three pounds of corn and 28 ounces of salsa. I have added roasted squash to it when I had some leftover and the corn seemed skimpy. You can adjust thickness and heat by adding more water or more salsa. I have made it with green salsa (salsa verde): the thing is, green salsa tends to make the soup too hot (this soup gains heat as it sits) and the color is not as pretty — I would recommend using red. If you don’t like cilantro, this is not a soup for you — I can’t think of another winter herb to substitute for it. If you can, go for it and report back to the rest of us. This soup has every virtue you could want: it is low in fat, gluten-free, dairy-free and makes use of seasonal herbs and citrus, plus common foods stored for the winter. The thing is, it does not taste like a virtuous soup, and you can always eat it with toasted cheese. Someone I know once suggested putting shrimp in it. Have at it. For more soups and salads featuring fresh herbs, check out the February entries at No Croutons Required on Tinned Tomatoes. Chewing notes: This soup will not give you opportunity for chewing practice, but perhaps you could eat it with some bread, tortillas, or a green salad. I can attest to the fact that chewing See’s chocolates does not make you eat fewer of them, but it does allow you to enjoy them more — guess what we eat on Valentine’s Day? Good to have you back, Sharyn! I missed your water colors. I’m not a fan of cilantro and usually sub parsley for it. i’d be more than willing to try it here with your soup, for I’m a big fan of corn. Serve it in soup, chowder, roasted on the cob, in relish, you name it, I like it. Although it’s true that using parsley would change the flavoring, I think it will work just fine for me. Thanks for the recipe. Thank you, John. I’ve never seen parsley with the roots on. I thought about suggesting it, but it is such a different flavor and I wasn’t sure how it would play with the salsa. Glad to have you back Sharyn. My dear uncle (my father’s brother who passed away last March) chewed his food 32 times. I tried it a few times and it made the food indescribably gross in my mouth, no taste, just paste. I would love to do it Sharyn, it would be so much healthier; they say it takes you about 20 minutes to feel full, and if you scarf down your meal in 5, then how could you possibly tell you are full. It makes so much sense. I will try it again, with your inspiration, thank you. (Wish I would have read this before dinner tonight, it was JT’s mediterranean pasta which is so hard to resists — ate too much, for sure). I do love cilantro and your soup sounds wonderful. I love that you use the roots too (a chef-friend mentioned that ages ago, but I have yet to do it). Thanks, Eva. Notice that I didn’t recommend chewing everything thirty times all the time. If your food gets gross, swallow it by all means — I think many of us food types want to walk the line between taking pleasure from our food and scarfing it down. Another suggestion I didn’t include is to put your fork down after each bite: many of us hover with fork in hand. Cilantro roots have a lot of flavor. Thank you, Christina. I like corn chowder, too, and make it in the summer and early fall when I have bell peppers. This makes a nice, spicy variation. It was interesting, BAM. I didn’t print everything. One woman said meat tasted nasty if you chewed it a lot — I didn’t notice that with chicken. I will confess to taking an occasional bite of warm cherry pie between typing words of this comment: I take a bite, chew it, swallow it, type a sentence. Hope you enjoy the soup — it’s simple and useful. Thanks, yummy. Easy, too, and quick. Oh well, a secret is a secret. Some lucky person has eaten them by now — I was just curious. The soup is lovely and so simple to make — great for when you need a quick soup and the larder is bare. So nice to have you back, Sharyn! It is good to stop and chew thoughtfully every now and then…or at least think about slowing down while you eat. I think your soup sounds so interesting, especially blending all the ingredients together and I happen to really like the taste of cilantro. I hope you did bring back that recipe for the butternut squash lasagna with the bechamel…it sounds amazing! Lucky you, to have such an interesting trip and See’s Candy for Valentine’s, too. That’s my mom’s favorite candy! rhododendrons! man i miss those. have you ever been to the sonoma horticultural nursery in sebastopol? during bloom season it is untouchable in its beauty. I’m going to be up in Windsor next month — maybe I can wangle a field trip to the nursery (my best friend’s husband adores trees). I’m working on the lasagna, but I didn’t manage to bring back any pinons due to snow upon our departure. Oh, I haven’t tasted See’s Chocolates since my days near St. Louis… please savor one for me! How lovely your Spring flowers are in bloom! Ours are still weeks (months) away, but that’s okay… your corn soup sounds perfect for a snowy day. So glad you shared this recipe! I remember Radio Valencia in the Mission fondly. 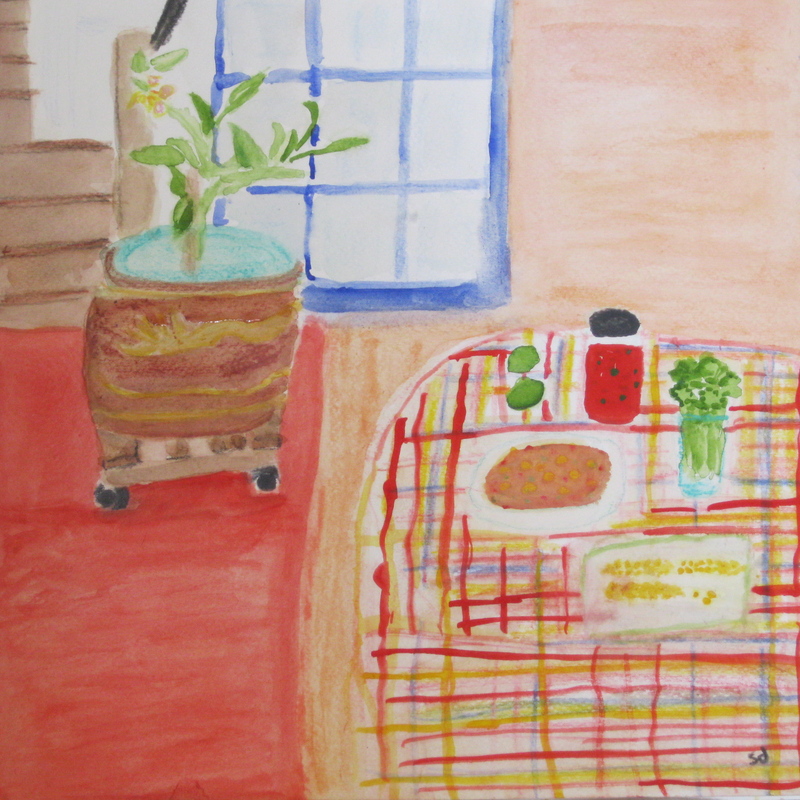 I’m enjoying your lyrical writing and colorful tablecloth in your painting. Good reminder to really notice and enjoy our precious food. Thanks, Suzanne. I remember first tasting this soup and thinking about it as I ate it, “Hmm. What did they put in this?” The tablecloth was fun! Thanks, Debra. The chewing meditation is a new addition: mostly we sit, walk and write in silence for five days. We eat meals in silence, too. But we get to talk to each other on the first night and the last night. Silent breakfast the last morning though. The soup is easy — give it a try: the roots add a lot of flavor. Welcome back Sharyn! and I love what you brought back with you to share! Chewing 30 times!! I read something similar to this years ago, basically chewing each bite at least 10 times to slow down and enjoy your food. I do try with each meal, but there are too many times I forget!! With your post I will make another effort to slow down and love your tip to think about all that surrounds the creation of the food we eat. This soup is amazingly simple – my daughter will certainly have all these ingredients on hand – just grabbing some fresh cilantro, which she does often. Now roots and all is new to me, but I’ll give it a try! Thanks, Linda. The 30 times is a guideline for paying attention — 30 chews keep you from swallowing anything whole and you do have an opportunity to notice every taste and texture. After the three meal, three-bite experiment, Natalie amended it to chewing it until it was chewed — that meant we could stop chasing a tiny morsel to get in two more chews! The soup is simple — and good. Hi Sharyn – glad you’re safely back! I love the sound of this soup, and cilantro… oh, that herb! It’s my favourite in the world! Great combination of flavours! Thanks, Charles. It’s a lovely, simple soup. The flavor will vary, according to the salsa you choose. I, too, am fond of cilantro. Folders? I’m trying to picture it (Really, I’m more auditory than visual — painting helps develop my visual skills). In the past I’ve made small note cards from selected paintings and in 2010 I did a small run of illustrated cookbooks for Christmas presents with one recipe per month, plus a cover. In my family, I would want to save special foods for “later” (still do) and there was no later. Well I have two, almost properly working hands now so I can make this soup. And you are right about wanting a change from the roots and greens of winter. I usually have homegrown sweetcorn in the freezer but the badgers ate it all before i picked it this year! But now you’ve planted a seed in my head and that is what I want. The chewing thing – I’m picturing you all at the dinner table, quietly chewing and counting 🙂 You are right, we should slow down and notice. Yes, I could see the improvement when you posted the fish recipe. What a relief, huh? So you grow your own sweet corn? Amazing. I’ll bet the badgers enjoyed it. I usually sit at one end of the long refectory table and so could watch eleven people chewing. Nice post and I love the recipe; will have to try it. And, I will also try the 30 chews technique. Sounds good and, hopefully, slowing down the dining experience will mean eating less. Thanks for visiting, Monica. Several people noticed that they ate less when chewing consciously. Others said they felt better. I love how simple this is. But I’m not sure how slowly I could eat it! Well, it doesn’t require much chewing, Greg. You could explore the experience of eating it as fast as you can, but it is best served hot or at least warm! Just when I have decided to slow myself down, but had not thought of taking the practice all the way to the dinner plate. Thank you. I will chew on this! You are welcome, Granny. I skipped town again for awhile — this time I was with four other ballad singers in Amador County. Are you saying that you are a ballad singer? For some reason I imagine (fantasy world kicking in again) a troupe of distinguished troubadours. Tell me more, if you wish. Thanks, Jacqueline. We eat it frequently. @ Granny re: ballads. I have sung ballads (originally learned from records) since I was young. One of my ballad-singing friends had a house-party where five of us sang as many of the ballads in the Child collection as we knew: between us we knew 140 of the 305.